I hate tours. I say hate with a capital 8. Short on time, the only practical way to see the Amalfi Coast and Pompeii is on an 8 hour bus tour which goes for $85. The mini hell bus picked us up at 8:30AM. Our guide was very nice but he sure did like to talk. The first fact is that Naples is inhabited by 1 million people (roughly the size of Detroit), making it the biggest city in Italy. First we stopped for a photo of the active volcano, Mount Vesuvius. Then it was off to Sorrento for another photo. Then it was time for the tradition of all tours– a pit stop for the bathroom which is an excuse to try and sell something. In this instance, it was Limoncello di Capri. I’ve had this sweet digestif many a time and have to say I enjoy the New York one much more than the authentic Italian variety. At the tasting (sales pitch), we had three to try. The first was 22 percent alcohol and was standard. The second was cream which you can put on ice cream. That was not very good. The final was the 42 percent death poison. “No thank you,” was my response, especially at 10AM. Our tour guide said that every year famous actors come to the Amalfi Coast. Last year was Denzel and Will. This year it’s TPOL. We stopped in Positano for more pictures. From there it was off to lunch. I splurged for a bottle of white wine for 28 euros. The waiter said it was the best white on the menu. I believe the phrase ‘when in Rome’ was coined to make tourists feel fine for the ripoff they experience in Italy. I say this after spending 13 euros on too much Gelato and a double espresso in the town of Amalfi. And also for 6 euros for a double espresso and 7 for a Gelato which included the 1 euro service fee for sitting down at this little table. Amalfi is a bigger tourist trap than Capri. I asked the waiter if he was a millionaire and he said that he just worked there. I guess I’m supposed to shut up and enjoy the moment and do as the Romans do. If only I could duck tourists when they come to the States. After that it was on to Pompeii, a city that went under thanks to an angry volcano. TPOL hates guided tours, but somehow I was convinced by the tour operator that this guide was worth having. Five minutes in and I’m on my BlackBerry writing this part of the post. The only tour guide I need is Wikitravel and my imagination (think Slumdog Millionaire’s chaiwala tour of Taj Mahal).‎ The true story of Pompeii was written a long time ago, a real long time ago by an Italian poet named Shakur who coined the phrase, “We’ll burn this b!&$h down get us pissed.” And there you go. Of course, we had to get swindled one more time. Using the bathroom outside the burnt down city costs 0.5 euros. It’s better to do a day trip to Sorrento than it is to go on a long, exhausting tour to take hurried photos. While tour guides don’t beg for tips, they do beg for TripAdvisor reviews. Be ready for that. I was told Amalfi is famous for its gelato. In reality, Amalfi is infamous for overcharging for gelato. Next articleAmex Blue Business Approved! The Best Everyday Card? Now, this is a very valuable review. Thanks a lot!!! We had a lovely weekend in Positano after a week in Rome. I was very wary with reviews like this, but it was very reasonable. However, we did it all on our own after scouring the Tripadvisor forums for advice. Find where the locals shop. Simply avoid the tourist traps and the tours.The coast is spectacular! Thank you. Sounds like you had a better time. Well deserved for planning it in advance. We were just there a few weeks ago and had such a great time, we are going back next year! Stayed in Sorrento and Amalfi. Did the trip on our own too…lots of pre-planning paid off.. No tourist traps for us…we found everything reasonably priced and the people were super friendly and helpful…of course we are pretty adept at sniffing out tourist traps and avoiding them! Ha! Our only complaint was Naples…won’t be returning there; thankfully we only spent one day there. I have to get defensive and say that I am usually adept at avoiding tourist traps but dropped the ball on this one. I don’t plan things before I go on a trip(post to come). I pick a bunch of cities and wing it when I get there. Sometimes it works out and sometimes this happens. But the reason it did is because I broke my own rule of not going on organized tours! I was just there in April and I completely agree with you! It is an amazing place to visit! His review is BS. The Amalfi coast is breathtaking! A private tour is the way to go. He does not sound like a fun person to travel with. The 8 hour driving tour was the best day of our vacation in Italy. We used Simply Amalfi and Salvatore was our guide. Awesome!!! I actually read it all and yes you said it was beautiful but then the rest was pretty negative. I am not sure why you took a bus tour when you are not a tour guy…. hated it, then trashed the entire region because of your bad experience on a bus. You actually may have deterred some people from going to one of the most amazing places in the world because you didn’t do your homework. Shame on you. On your blackberry in Pompeii… haha says it all! Stop looking for negative things, put down your phone and enjoy what is around you. If the situation is not so great…. maybe try to make the best of it and find the positive. Hate to say you did it wrong, but you did it wrong. The Amalfi really shouldn’t be attempted in a day trip. And if it is, a private tour operator would be the way to go, albeit much pricier. F the whole bus thing, nope.. nope…nope. We enjoyed four days this March on the Amalfi Coast in Positano and Ravello, and thoroughly enjoyed it. Positano was pricey, and some of the restaurants were touristy, but with a little research we were able to find completely legit, local places that were excellent. To avoid more rambling, I’ll cut to the moral of the story: the Amalfi Coast really shouldn’t be treated as a day trip. You are right…it’s a beautiful place to relax, hike and eat! When did you go there? I got married in Ravello this March. Just wondering if you saw a wedding couple walking around town, it’s quite shocking to see how a lot of residents there actually knew we’re getting married. Completely agree with your hole in the wall restaurant comment, and we found that an attempt to speak Italian helped us so much (we knew nothing other than ciao before the trip). Lol no i was there in may. I wrote the post in real time but posted it today with pics. Congrats! Going there in 3 weeks. Can you give any recommendations on which local places to go dine at please? Really want to avoid the ” tourist trap” restaurants. See the Lombardis post for pizza. The trattorias are good for basic Italian food at good prices. Totally agree with cleo brown. The trick for Amalfi is to rent a car and do it yourself. There are some really beautiful little hotels in Sorrento and Amalfi and getting to spend the evenings walking through the town and eating al fresco at delicious restaurants was fantastic. In Sorrento we rented a little boat and took it ourselves to Capri and the caves along the cliffs – was a fantastic afternoon. 95% of the time it’s better to do these things without a tour and plan our own trip. And spend as little time in Naples as is necessary, what a dump! 99.9 percent of the time! We hired a private guide for Pompeii which was an absolutely fabulous experience. I hate group tours but cannot imagine understanding the complexities of Pompeii with someone who was actually an expert. The 250 Euro that I spent on six hours of the guide (including pick up and drop off from the train station in Naples) was worth every penny. Wrong is an understatement. Rent a car and drive. I drove amalfi coast 6 times. Parking is expensive but available – there are parking lots even on the little circle road in positano. Hike the path of gods, go to ravello, walk along the water in positano, stop by paper shops in amalfi, this is not a one day tour from Napoli. It’s certainly easier to do it from Sorrento and even then it will be at least 2 full but relaxed days. I rented a car through hertz before leaving the states. The overall cost of the rental was a fraction of what transportation would have cost for the trip. Allowing us to visit more cities and drive the Amalfi coast ourselves. I’d highly recommend this route to anyone traveling to Italy. For a total of 21 days the cost for the rental was approx. $750 USD. The international license (purchased at AAA) was $20 USD. Two recommendations if taking this route, purchase your own gps and purchase the maps for europe $99 USD (country specific map $79 USD). With garmin nuvi there is a free 30 day speed camera add-on (HIGHLY recommended) familiarize yourself with each cities historic districts. They have limited traffic zones (ZTL’s) which require special permits, otherwise you’ll get fined. There are websites that overlay those zones onto google maps. Screenshot it and you’ll have it abroad. Another thing you can do is offline download a map of each city on google maps. That will allow your to see where you are without utilizing data. Your hotel reception will tell you what areas you can’t drive. Typically after 6p or 7p local time. The car rental gives you the freedom to tavel outside of your tourist traps, and eat authentically with the locals. All of this made the Amalfi Coast enjoyable beyond words. After spending 21 days in Italy the trip totalled approx $3,500 for two people. This included airfare, hotel (Holiday Inn Express), car rental (Fiat Panda), and food. Panda!! Thanks for sharing. We rented one in Sicily. If you stay in positano you can find many good places that are reasonable. If you breeze thru on a tour why would you not expect to get a tourist point of view. Fair point but sometimes time is not in abundant supply and I try to do it all. What a shame you couldn’t enjoy this beautiful part of the world! My husband and I just got back a week ago from Rome, Florence, Montepulciano and Sorrento, and loved every minute of it, including the day trip to Positano. We learned a long time ago to NEVER take bus tours. We took a taxi/van from Sorrento to Positano, which went via the circuitous vista of the mountain road. Gorgeous! We walked around the town, had a snack at one of the scenic restaurants and later took the ferry back. I’d recommend this. We had also taken the ferry from Naples to Sorrento. It’s the best way to go, and not expensive. Oh, and Pompei was fascinating. The article isn’t cynical! Don’t twist the words. I’m cynical of tours. The rest of your comment is sound advice. 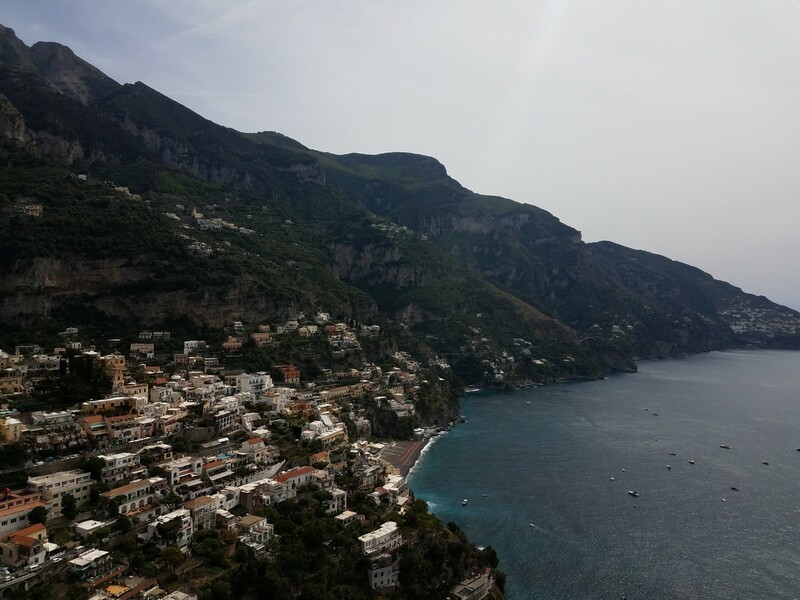 We went to the Amalfi coast in October for 5 days and had an amazing time seeing Positano and Capri while staying in Priano. I think a day tour seeing as much as you did is a waste. You don’t get the flavor of a town or village. Naples was pointless (the pizza was probably the worst I’ve ever had) while in Priano we had the best second to Rome. Save tours for historic sites and maybe a day boat to Capri. Otherwise take the bus from Amalfi to Positano for about 4 euros. Bonjourno! Capri is pretty but not for that price. A lot of the comments are about reasonable prices and how beautiful amalfi is. There are other places in the world that are just as beautiful, if not more, for much less. Just stay off the bus and stay in Positano for a few days. It is fantastic. Beca de Bacco is a wonderful hotel. positano is very pretty – and yes you should spend a day there to enjoy the views. but wouldn’t stay more than one night. it’s very much a tourist city. Taking a bus tour is probably the worst way to see the Amalfi Coast especially in the summer. Taking a bus from point A to point B while staying there is not so bad. I would recommend first, staying on the coast itself. Avoid Positano and Amalfi as it is pricier and more crowded. We stayed in a well priced beautiful hotel in Conci dei Marini. Our balcony was right on the ocean and it was very romantic and the view was stunning. We hired a driver for a day and half and it was our favorite part of our trip to Italy. Our driver at Simply Amalfi was great. He knew the area and talked about it with such passion. Stopped anywhere we wanted to and had a great sense of humor. He took us to a fantastic restaurant where the locals go with a breathtaking view!!!! It was not over priced and the food was great. So whether you are there for the day, a few nights or just a cruise stop… do your homework and do a car tour. It is worth it!! The Amalfi Coast is so beautiful.and the people were very nice!! We went in September so it was not as busy along the main road… so a bit off season. Our driver took us to Ravello, to lunch, Amalfi and Positano. All were just enough to see the area in the short time we were there. It was an 8 hour tour but he stayed with us 9.5 hours because we were having so much fun. He also picked us up from the train in Naples, brought us to Pompeii and then through the mountain roads (which was really cool) and to our hotel. I would also highly recommend taking a boat tour to Capri. Our boat had about 12 people on it and hugged the shore line as we headed toward Capri. The boat ride with views along the coast is stunning!!! We went to the non touristy grottos where we could get out and swim. While the shopping in Capri is crazy expensive the scenery is beautiful. Go to Ana Capri and enjoy the scenery. We found an amazing restaurant by going off the beaten track a bit and had the best octopus salad in my life!! 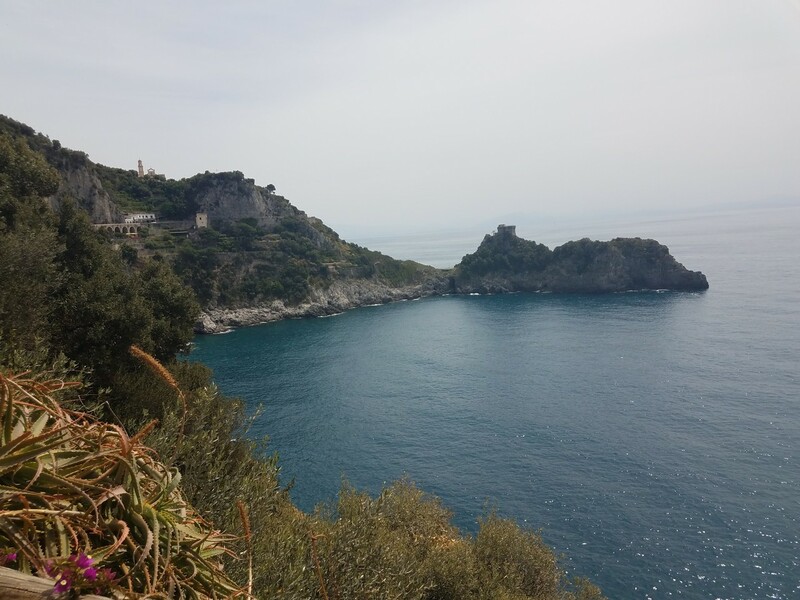 Check out Simply Amalfi for a tour… you wont regret it. We actually keep in touch with our driver Salvatore through FB and he may come visit next fall. It’s always a good idea to do your homework and plan at least some of things you do especially if you may do this only once!! When I travel abroad I like to combine some planning and some spontaneity. I read a ton of reviews on tripadvisor etc and learn a lot!! I hope our friend who wrote this article give the Amalfi Coast another chance!!! It really was a beautiful experience!!!! So sorry for you that you did not enjoy all that Italy has to offer. Your first BIG mistake was the bus tour. You are obviously not a seasoned traveler, and didn’t do your homework before your trip. With all the information available at your fingertips on the internet, you should have planned better. I have been to Italy many times and have booked all of my hotels online in Sorrento, Capri, Amalfi, Maiori and Rome. You can book a villa for a VERY reasonable rate as well. Any time you travel, there are tourist areas that will try to sell you a variety of their local items. Sounds to me like everything annoyed you, so you might be best to STAY HOME. You wouldn’t travel anywhere just for photos! You missed out on great food, wine and venues. Sorry for your loss! 1. I admitted it was a mistake to do the bus. That’s how I led off the post. 3. I don’t do homework. I just go. Sometimes it works out and sometimes I regret not doing a bit of research. 5. Stay home? Stupid thing to even suggest. 6. Photos are a big part of travel, especially because I’m a blogger. 7. Missed out? No one can bat 100% on every trip. Some experiences are better than others. I write about both so readers can use the information I provide to do or not do as I did. I’m in Positano as I write and found this hysterical and spot on write-up after searching “Positano ripoff”. Thank you for the much needed belly laughs! I do my homework and pre-plan, blah blah blah, but felt so disillusioned upon arrival yesterday. Seems like the whole town is phoning it in. Went to the grocery store and it seemed the lady that checked us out just charged whatever she felt like. Got a few things and it was 50 bucks in a matter of seconds. We’ll figure it out but TPOL, I needed that laugh- thank YOU!